When someone mentions fiction in free verse, we all know who immediately comes to mind: Ellen Hopkins. Arguably, Hopkins has been the greatest advocate for this style of writing, particularly for young adults. My vocal advocacy for Hopkins’ fiction is why Crossan’s publicist thought I’d like One by Sarah Crossan. One tells the story of Siamese twins Grace and Tippi, who have been home-schooled their entire lives, but now because of financial strain will need to join traditional schooling. Literally joined at the hip, they brave this new (and scary) adventure together, and clumsily navigate their way through high school—with even more gawking and ridicule than is normal for two teenage girls. Grace and Tippi have been joined for sixteen years. They have two legs, share everything in the hip region, and then break apart again with two torsos, four arms, and two heads. Their entire lives have been revolving around this one question: are they one person, or two? Brilliantly crafted, Crossan digs into what it means to be a person; what it means to be an individual. Are Grace and Tippi two people, or because they’re joined physically, are they one? Grace and Tippi, on their first day of school, meet Yasmeen and Jon. This, to me, was a literal Godsend. I love how, from the very beginning, Yasmeen and Jon don’t treat Grace and Tippi like circus freak shows: they treat them like fellow students. The girls are incredibly lucky to have found Yasmeen and Jon, as I don’t think they could have found two more perfect friends. Yasmeen and Jon let the girls just be, arguably for the first time in their lives; they don’t treat them like they’re sick or dying, but just as humans trying to live average lives. At the same time, Yasmeen and Jon foster uniqueness in the girls without them even realizing it: they boast their being conjoined, reminding them that they’re beautiful just the way they are. One is as much about friendship as it is about finding one’s individuality. One, for me, was one of these rare books that tells a story actually worth telling. Grace and Tippi feel real to me, like they actually existed and Tippi is now gone from this world. My heart aches that Grace is now alone. My heart aches knowing that Grace will always look to her left, expecting her other half to be there, only to find that she’s vanished; that she’s never coming back. Grace and Tippi were meant to be together, even if not physically then at least on the same planet. Even though I wanted Grace and Jon to be together, to reallybe together, I didn’t want that to be at the expense of Tippi. Tippi wasn’t supposed to be the one to not make it through this; that was supposed to be Grace. When I learned of Tippi’s death, I felt exactly as I had when I found out that Gus was the one who would die of terminal cancer rather than Hazel: bamboozled, like I’ve had the rug pulled out from underneath me. Not only did the girls face this life-threatening arrangement that comes from being conjoined, but they also had to deal with the trials and tribulations of everyday life: how they’d pass finals, how to get their father to stop drinking, how to make enough money so that they could remain in their home. One truly is a novel that tackles it all: it covers all revolving aspects of life. Neither of these girls deserved this fate, and my heart feels like there’s a hole in it. I find it difficult to pinpoint the right words to describe how poignant and honest this book is. I feel like, after readingOne, I’ve gotten the tiniest glimpse into what it’s like to live life as a conjoined person; to live life for two, and not just one. Crossan has opened my eyes to a way of life not like my own, just as Hopkins repeatedly does. In that sense, these two ladies are masters. They’re two, forever and always, but they’re also one. And when that one splits apart, only half can go on; and she’s got to decide that that’s something she wants to do. Because the choice, for once in her life, is hers. 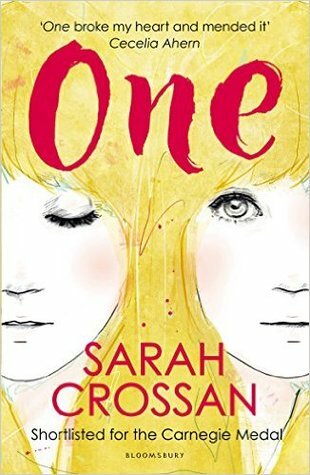 My full review of Sarah Crossan’s One is also available on Goodreads. Have you read One? What did you think? Please leave a comment below (spoiler free)!